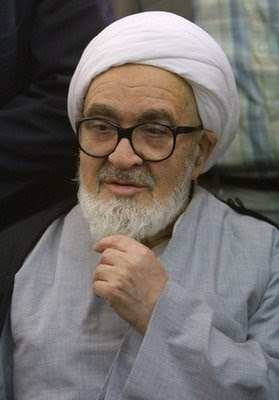 The Grand Ayatollah Hossein 'Ali Montazeri, one of the most highly respected senior religious scholars in Iran, was once close to Khomeini, and was even spoken of as Khomeini's possible successor. But he was marginalized after questioning the authoritarian path taken by the revolution. Since then he has been a steady critic of the Iranian regime, and has periodically been placed under house arrest, but he's too prominent a figure to be imprisoned or silenced. In short, Montazeri is a political outsider, even a dissident of sorts, but one who commands widespread respect. Therefore, his response to Friday's presidential election and the ongoing unrest has been awaited with considerable interest. He has now issued a statement condemning the fraudulent election results and the subsequent repression of the opposition, supporting peaceful protests, and warning against violence.